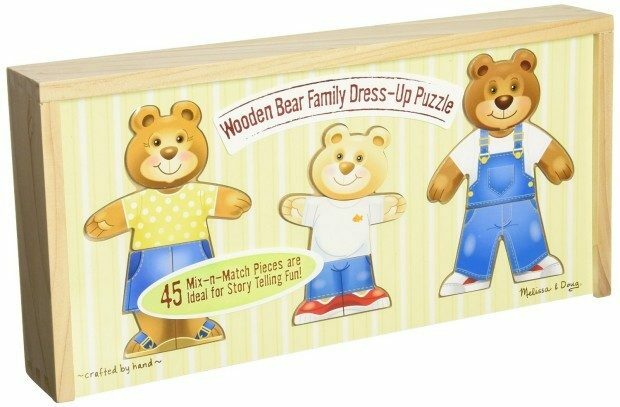 Head over to Amazon and order the Melissa & Doug Wooden Bear Family Dress-Up Puzzle for Only $14.99! (30% Off!) Ships for FREE on orders of $35+ or if you have Prime! The Melissa & Doug Wooden Bear Family Dress-Up Puzzle includes 45 sturdy, colorful mix-and-match pieces to spark imaginative play. Designed for ages three and up, this puzzle comes with a range of facial expressions and plenty of fun clothes to put together to create Mama, Papa, and Baby Bear characters. Puzzle pieces can be stored in the included wooden box, whose lid conveniently serves as a puzzle board.